A year on, she's much more able to understand things, and so I thought I'd explained to her that Homer is nothing to do with Christmas. We've been reading her the nativity story, and The Night Before Christmas poem, so we're trying to give her an idea of what Christmas is traditionally about. I thought this was case closed. At the weekend ThingOne saw a picture of the whole Simpson family in The Guardian. She was interested as she'd recently seen a picture of Lisa Simpson on a birthday card and was keen to know who the other Simpsons were. All was fine until we got to the dog. ThingOne asked the dog's name. 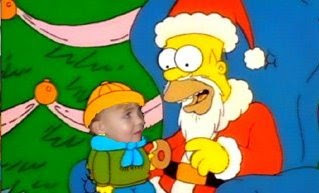 "OK, ThingOne, I will tell you, but you need to remember that I told you that Homer Simpson is NOT Santa. He's completely different." "He's called Santa's Little Helper." Confused silence. The kind of confused silence you hear when a child feels she's been lied to by her dad. "But, ThingOne, that's just his name. 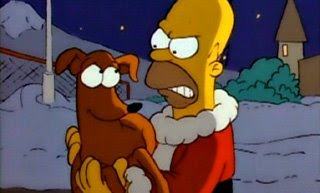 He's not Santa's dog, he's Homer's dog. Well, Bart's dog I think." "Shall we do something else ThingOne? Would you like a biscuit?" I may need to show her some Simpsons episodes. Just not one where Homer dresses as Santa.